Dental Implants Market size was valued at USD 3.7 billion in 2017 and is expected to witness approximately 5.0% CAGR from 2018 to 2024. Technological advances in dental implants will drive the demand for dental implant during the forecast period. For instance, Cone Beam three-dimensional imaging allows the dentist to place the dental implant accurately with total control, resulting in more adoption. Technological advancements ensure minimally invasive surgery with no incisions and completion of the surgical procedure on same day of dental visit. Moreover, emergence of nanostructured titanium implant offers better integration with bone and is less susceptible to infections, making them one of the preferred products. Advents in dental implant technology will offer better outcomes and efficient implant treatment, resulting in rise in demand, thereby positively impacting business growth. Rising adoption of cosmetic dentistry will drive the market growth in upcoming years. Shift in facial structure, arising from tooth loss, results in loss of facial aesthetics. As a result, large number of people in developed countries are widely accepting cosmetic dentistry. Dental implant being a long-term solution of cosmetic restoration will increase patient preference, thereby augment market growth. For instance, according to a survey conducted by American Academy of Cosmetic Dentistry, cosmetic dentistry is found to be trending in the urban areas of U.S. Thus, increasing trend in cosmetic dentistry should impel business growth in the upcoming period. Increasing number of dental disorders across the globe will boost the demand for dental implants in forthcoming years. Rising number of patients with dental issues such as periodontal disorders and cavities. Increasing dental problems arising from smoking and improper brushing of teeth further add to the risk factors leading to tooth loss, resulting in rising demand for implants. However, high cost of dental implants will negatively impact market growth. Strict regulations by various regulatory bodies along with limited reimbursement policies in developing countries may restrict industry growth during the forecast years. Tapered implants market held 77.7% revenue share in 2017 and is estimated to grow at a significant rate over the forecast period, owing to better stability and self-tapping property of tapered dental implants. Moreover, tapered implants prevent the risk of perforation because of anatomic concavities; thus, fuel its adoption. Parallel walled implants market will grow at 4.6% CAGR during the forecast period due to benefits offered by the same. Advantages such as high success rate of endosseous parallel and availability of premium parallel walled implant that does not produce bone compression will contribute to their rising demand. Preferability of parallel walled dental implants will augment industry growth over the projection period. Titanium dental implants industry held around 71% market share in 2017. Increasing usage of titanium and its alloys as the gold standard for manufacturing of dental implants owing to its biocompatible nature will augment market size. Advantages offered by titanium implants such as higher success rate, low thermal conductivity and ability to osseointegrate will drive segmental growth over the forecast period. 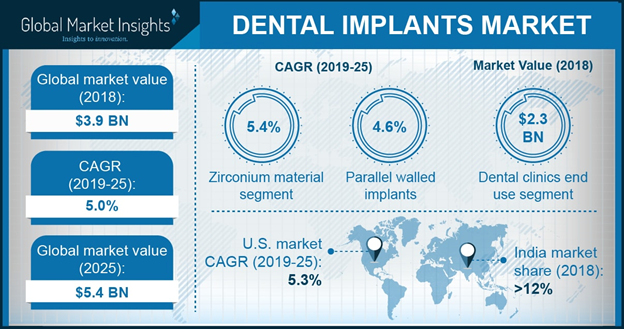 Zirconium dental implant industry is estimated to grow at 5.4% CAGR from 2018-2024. Strong resistance to corrosion, better gingival health, preservation of bone along with excellent aesthetic properties owing to metal-free nature makes it suitable option over titanium implants. Increasing demand for zirconia implants from patients having titanium allergies will further favour business growth. Dental clinics segment accounted for over USD 2.2 billion in 2017, owing to cost-effective dental implant procedures and better patient outreach in dental clinics facilities. Wide availability of technological advanced dental implants increases the patient preference for dental clinics. With increase in number of specialized dental clinics more and more procedures will be performed. In addition, convenient screening and diagnosis services provided by clinical set-ups makes the most preferred choice among all dental healthcare facilities. Dental implants hospital business segment is estimated to grow with 4.6% CAGR during the forecast timeframe. Hospital facilities are improving at a remarkable pace with regards to provision of multi- specialties. Presence of dental surgeons in hospitals coupled with diagnostic aids will drive demand for dental implants in hospital. Additionally, favourable reimbursement policies should impel segmental share over the projection years. Germany market held largest share in European region, accounting for USD 289.6 million in 2017, owing to high edentulous geriatric patient base generating high demand for dental implants across the country. One in eight people aged 65 years and above is edentulous in Germany and the number is increasing at a rapid pace thereby augmenting industry expansion. U.S. market valued over USD 1.1 billion in 2017 owing to rapid rise in number of baby boomers along with increase in prevalence of oral disorders in the country. As per American College of Prosthodontists, around 35 million Americans have missing teeth in one or both the jaws that will augment the demand for dental implants in the U.S.
Asia Pacific market is forecasted to grow at a rapid 6.5% CAGR over the projected timeframe. Increasing adoption of dental implants in countries such as South Korea owing to favourable reimbursement policies for senior citizens along with presence of well-established market players will favour industry expansion. Emerging markets in India and China will grow at a robust rate owing to growing geriatric population, rising dental tourism, increasing disposable income and healthcare expenditure. Some of the prominent market players operating in global market are Dentsply Sirona, Danaher Corporation, Institut Straumann AG, Zimmer-Biomet, Glidewell Laboratories, Osstem Implant, BioHorizons, ADIN Dental Implants Systems, Henry Schein, Biotech Dental, A.B. 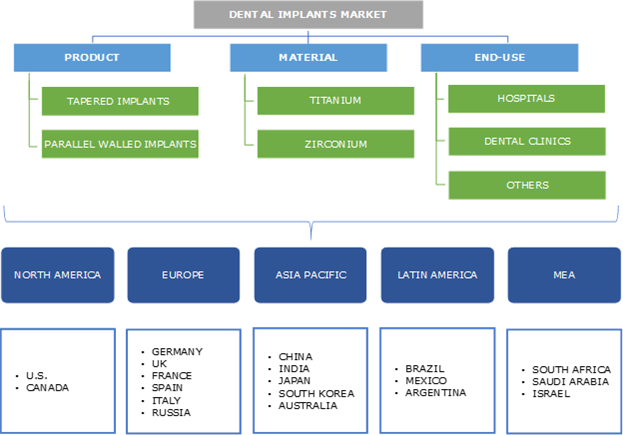 Dental Devices Ltd., Avinent Implant Systems, CAMLOG Biotechnologies AG, Bicon LLC and Cortex Dental Implants Industries Ltd. Market players are focusing on strategic alliances, mergers, acquisition and technological advancements to expand business and their geographic reach. For instance, Straumann Group acquired a dental distribution company called Same Day Solutions (SDS) in Portugal. This strategic move will enable the firm to enhance operations in the country and expand its sales team and customer base. Escalating geriatric population prone to oral health problems, rising acceptance and adoption of cosmetic dentistry in developed economies will drive the demand for dental implants in recent years. Growing number of patient pool with dental disorders coupled with technological advancements in dental implants will further augment industry growth in the forthcoming period. Major industry players are focusing on collaborations, new product launch and strategic partnerships to strengthen their market presence and competitiveness.